Check out today's pricing and retail availability for Tommasi Arele Appassimento. Inspired by this wine in August, 2015: Sitting on the porch rocking chair in the cool fall air, wool plaid blanket keeping the the chill away. 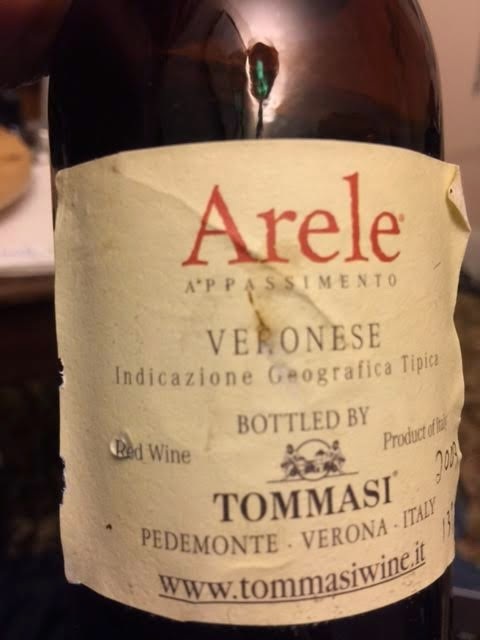 Original tasting and review : This is Tommasi Arele Appassimento Veronese, Verona, Piedmonte, Italy, 2009, finished at 13% alcohol and first sampled six years from vintage date, in January, 2015. In the glass: Dark magenta, opaque from a quarter inch in. On the nose: Poured at room temperature and swirled vigorously, shows bright, fruit blackberries and red currants. From the aroma, seems like this will be fresh, vibrant and young. On the palate: The primary elements on the palate are in fact rich with blackberry fruit, light acids and gentle surrounding tannins. The finish lasts longer than expected, settling slowly and clean.